Heading to Portugal and wondering what to pack? This Portugal packing list highlights all of the essentials. It includes a few obvious items that you’ll find on all packing lists like underwear (duh!) as well as a few other items you might not have thought to bring. Tip: Portugal is a long and narrow country, and the weather in the North of the country is often different to the South. 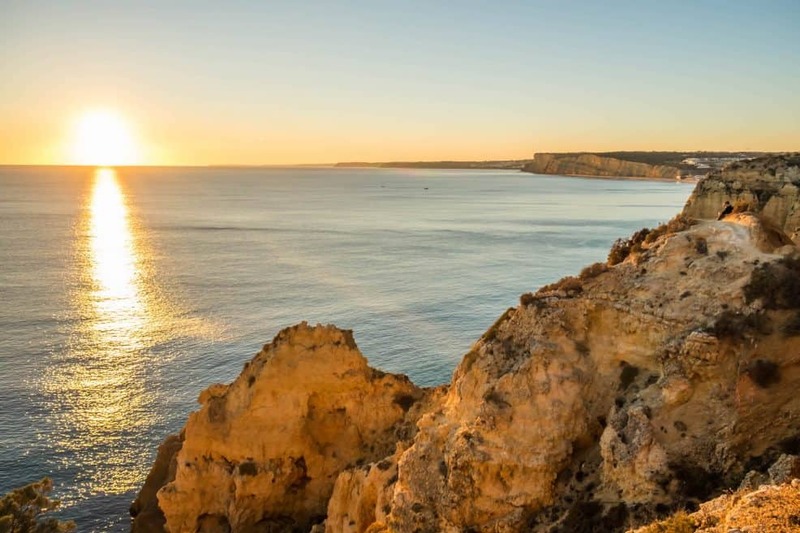 The Algarve, in the South of Portugal, gets around 300 days of sunshine per year. Porto and the North of Portugal, on the other hand, has a very different climate. During winter, the weather can be damp, gray, and wet. If you’re planning on visiting both the North and South of Portugal, especially during winter, keep this in mind as you’ll need to pack appropriately for both types of weather. Although the days are warm in Portugal, the temperature can drop considerably in the evening. While you might feel comfortable wearing a t-shirt during the day, in the evening you’ll be reaching for a jumper. I recommend bringing at least one just to be safe. bringing at least one just to be safe. If you’re visiting Portugal during the winter, it’s worth pointing out that the houses are very cold inside. Portuguese houses tend to stay cool during the summer, and most don’t have central heating, so you’ll be thankful for any warm clothes that you have. You’ll probably be bringing your passport with you anyway, but did you know that in Portugal it’s a legal requirement to carry ID on you at all times? If you’re not comfortable carrying your passport on you, be sure to make some photocopies and bring them with you instead. It may also be worth getting a good passport holder so there isn’t much wear and tear on it. Portugal uses the Europlug, and you’ll need an adapter if your gadgets use a different type of plug. If you’re a frequent traveler, it may be worth purchasing a worldwide plug adapter that covers you for future trips in Europe and elsewhere in the world. I would recommend getting one like the one I have before you land on Amazon. The price may be doubled if you show up to Portugal in an outlet emergency. Throughout Europe, you can now use your smartphone to display your boarding pass instead of having to print it off. It’s worth downloading the airline apps (Ryanair, TAP, etc.) in advance as you may not have Wi-Fi on the day that you’re traveling. Portugal is an incredibly hilly country so what you’re wondering what to pack for Portugal good footwear is a must. Both Lisbon and Porto have very steep hills, which can become incredibly slippery when it rains. Most pairs of sneakers have good enough grip to tackle these hills, but it’s something that many people don’t bring with them. The Merrell Moab Ventilators are great shoes for men and women while hiking. Ladies can check out our guide to the best women’s travel shoes. Portugal is a warm and sunny country. In summer, temperatures in Lisbon can often reach 40 °C in the summer so it’s important that you put on plenty of sunscreen. Unfortunately, despite sunscreen being essential in Portugal, sunscreen can be quite expensive to buy here. If you’re planning on visiting, you’re probably better off buying it before you arrive. The World Pursuit likes to use Peak all natural sunscreen. The sun can be quite bright in Portugal, particularly when it bounces off the whitewashed buildings in the Algarve. You’ll also definitely want these if you’re planning to visit some of the best beaches in the Algarve. Reading is an essential part of a good trip, in my opinion. If you haven’t already chosen a book, why not read something by a Portuguese author? Two Portuguese authors to look at are José Saramago and Fernando Pessoa. In the summer months, sightseeing can be a sweaty event. Save your nicer clothes for the evening when the weather is that little bit cooler. You’ll want a few nice dresses or shirts, along with some pairs of trousers, for the evening when you visit Portugal’s many wonderful restaurants and bars. You can never have too many pairs of underwear or socks when you’re traveling. If I’m sightseeing, I like to be able to change into a fresh pair of both later in the evening. Flipflops and sandals are comfortable to wear, especially if you’re wearing a pair of hiking sandals (we love Teva’s and Merrells). It also means you don’t need to pack as many pairs of socks. 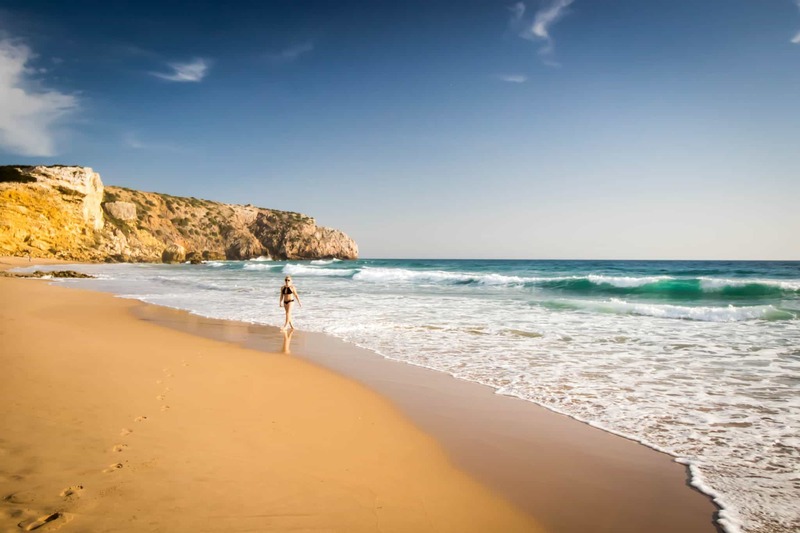 Portugal, and the Algarve especially, has some wonderful beaches that you cannot afford to miss so be sure to pack your swimsuit. It’s always a nice idea to pack a sarong as they pack up well and can serve many different uses. If you’re visiting Portugal during the peak summer months, you may not need to bring a raincoat. But, although Portugal can go weeks and even months without it raining, it does rain occasionally. If you have a light raincoat that doesn’t take up much room, it’s worth throwing one in your backpack just in case. I like my NorthFace rain jacket because it’s easy to pack up. A day bag is essential for carrying all of your stuff to the beach, or for having with you when you go sightseeing. Eagle Creek makes great ones that fold up into themselves! Check out our list of the best carry-on bags for more suggestions. Portugal is an incredibly beautiful country, and you’ll want to be able to take plenty of photos. If you have a camera, bring it with you. Otherwise, make sure your smartphone has plenty of space. Most of the photos on this website are taken with a Fujifilm X-T10. It’s so light making it great to travel around cities like Lisbon with. Check out more of our favorite travel cameras here! About the Author: James writes the travel blog Portugalist, a blog that covers his life in Portugal as well as offering advice and tips to those visiting his newly-adopted home. You can follow Portugalist on Facebook.